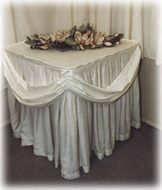 Clets Australia’s table skirting and valances is an extremely effortless way to enhance the presentation of a table. 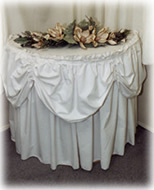 The Table Skirting and Valances are available in a range of materials, colours and of course styles. We also can supply skirting clips if needed; they are extremely useful clips that attaches onto the table and skirting without destroying the table and linen. 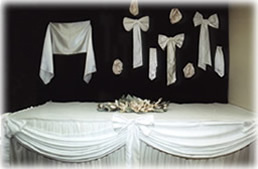 We also design and manufacture valances that enhance the bridal or guest tables for your occasion, and dual stage skirting.